Eshetu Mulugeta is from Keteme woreda in Arsi. despite the long journey to Addis Ababa, however, he has been to Tikur Anbessa Hospital quite a number of times over the years. He recently was once again at the hospital to look after his sister who was receiving medical care there. Therefore, he has a good idea of the state of service delivery in the hospital both in the past and the present. Eshetu remembers the hospital’s emergency OPD as a place where a large group of patients received treatment while being cared for by their loved ones in the congested corridors of the small area allotted for the ward. He’s, however, highly impressed with the changes he has witnessed this time around as the OPD has now moved to a new building. As to the service delivery, he was so grateful to get his sister an emergency appointment for CT-scan within just three days of their first checkup at the hospital for just 300 birr. He said that they were asked 950 birr for the service at a private facility. He also spoke highly of the recent trend of patient care he witnessed in the hospital. Eshetu’s opinion is shared by numerous other people who have known the hospital over the years. The opinions of the people we have spoken to indicate that more individuals are now eager to receive treatment at the hospital due to the reasonable price and quality customer care. The main reason behind these changes has been the effort by Tikur Anbessa Specialized Hospital and the Addis Ababa University College of Health Science to renovate diagnostic facilities at the hospital so as to deliver better diagnostic services, patient care and treatment for incoming patients. The recent renovation in the radiology and emergency departments is a way forward towards achieving the goals of delivering a better quality health service at the hospital. Towards this end, the holistic renovation in sub-units of radiology department is a demonstration of the eminent modernization of the health service provided by the hospital. In the past years, the radiology department had been battling to deliver ultrasound service with few old ultrasound machines. The long time ultrasound appointments were scheduled for forced numerous patients to try their luck in private health institutions. Likewise, the department had been providing the routine x-ray service using few old x-ray machines that frequently disrupted continuous service delivery. Thus, it was not uncommon to refer patients elsewhere and interrupt services at the hospital. The department also had an old model dual slice CT-scanner. However, it had also stopped working years ago. Altogether, these obstacles forced the department to live with those uncomfortable realities for years. Consequently, patients had to be referred to private health facilities that charged them a lot more for the service. Cognizant of these multi faceted problems, the hospital and college of health science set into action a transformational plan that radically changed the department’s service delivery. The changes include expansion of diagnostic facilities and procurement of modern diagnostic equipments and skilled manpower that would help deliver high quality service. Accordingly, two modern CT-scanners have been installed and are scanning 50-60 patients a day halting patient referral to private health facilities. These CT machines are among the latest breed of CT technology that deliver optimal and excellent diagnostic and interventional imaging services. Dr. Abebe Mekonnen, CT-scan unit Coordinator at Tikur Anbessa Hospital, stated that currently patients are receiving treatment at the hospital for free and those that pay are either getting the scanning service for free or for a price that is thrice less than that of private diagnostic centers in the city. The price for each exam is about 300ETB, which is nearly four times lower than the average price for the service in private diagnostic centers in Addis Ababa. Dr. Abebe also added that the department trained its staff on these technologies and set standard precautions for maintenance of the equipments. This fast and standardized service delivery at the radiology department has already created a better synergy between various units in the hospital, resulting in a better care for patients in the hospital as a whole. Misir Mitiku, who was there looking after her sister, stated that her sister received free treatment within the hospital without having to be referred elsewhere as the Black Lion has started the use of in-house CT-Scan Equipment – a service that has long been discontinued due to the previous machine going out of service. She went on to say that although she had to wait for up to 2 months, considering her sister’s case was not treated as an emergency, she and her sister are happy to have the CT-scan at Black Lion hospital due to the comparative financial advantage. 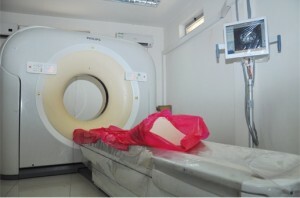 The price difference of having to pay 1,000 birr plus for CT-Scan in private facilities, to a comparative 300-birr scan within the hospital makes a huge difference to those that face several other medical expenses. She, however, noted that the months of waiting period is something the hospital should improve upon. The department has recently started to provide the inputs for CT scanning, like contrast media, as part of the package after patients were required to buy them separately. Taking this and some other facility related deficiencies as priority areas for improvement, it is still possible to deliver service with more quality and scope. In line with its expansion objectives, the hospital installed and launched its MRI service four months ago. This is a 1.5t MRI machine with all the recent MRI technology, which can produce optimal and excellent diagnostic images up to the standard of the current imaging requirements. 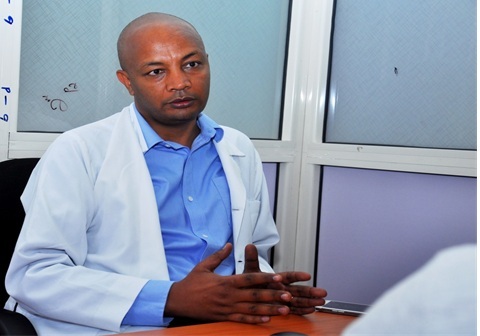 Tatek Girma, MRI coordinator at the hospital, explained in our interview that the service is being provided to all patients that are in need of it for the amount of 500ETB, which is a price 4-5 times less than the price at the private diagnostic centers in the city. More importantly, as many of the patients at the hospital receive their treatment for free, they receive this service free of charge as well. The unit serves 20-25 patients a day with optimal quality. Appointment dates can range from 6 – 12 days for normal appointment and emergency cases have much shorter timeframe. This complements other diagnostic options to a greater extent and enhances the imaging service at the hospital. The department is offering intensive training for staff and setting in place precautions and working procedures to standardize the service. Like other units, it is also working hard to get all inputs required for the procedures so as to deliver service with better quality at much cheaper price. Customers we have spoken to have expressed their delight at the fairness of the price while remarking that the waiting period is still too long compared to that of private facilities. They also pointed out problems at the Patient Card Center as presenting a challenge to returning patients. One of the major changes the hospital has gone through has to do with the improved facilities of the Emergency OPD that serves patients who come to the hospital seeking urgent treatment. Sirak Gugsa, Head Nurse at the Emergency OPD, stated that there used to be inadequate room to treat Emergency patients. With patients forced to wait in corridors and alleys, went on Sirak, administering service was difficult. Sirak also noted that administering different treatments for a patient could potentially jeopardize the level of care for other patients in the hospital’s crowded OPD of the past. He pointed out that the congestion was so severe that they had to work outdoors in the area in front of the Emergency OPD. With the expansion of the Emergency OPD and the new housing built, however, the shortage of room for treating patients and the resultant congestion in and outside of the Emergency OPD has been alleviated. Along with the improved housing for the Emergency OPD, more nurses have been hired along with the procurement of couches, Patient monitors and other equipment. Furthermore, a G+7 building to be used for emergency cases is under construction to tackle Emergency OPD service related problems. Therefore, there are brighter days ahead for service delivery in Ethiopia’s biggest referral hospital that serves people from all corners of the country. It is possible to teach old dog new tricks after all.